GOgroove’s Pal Bot is currently being offered at just $19.99, originally priced at $69.99. The Pal Bot weighs less than 1 lb and fits in your palm so you can take him anywhere! With his compact size, you can store him in bags, luggage, and more. Product page. Continue reading for a video demo. 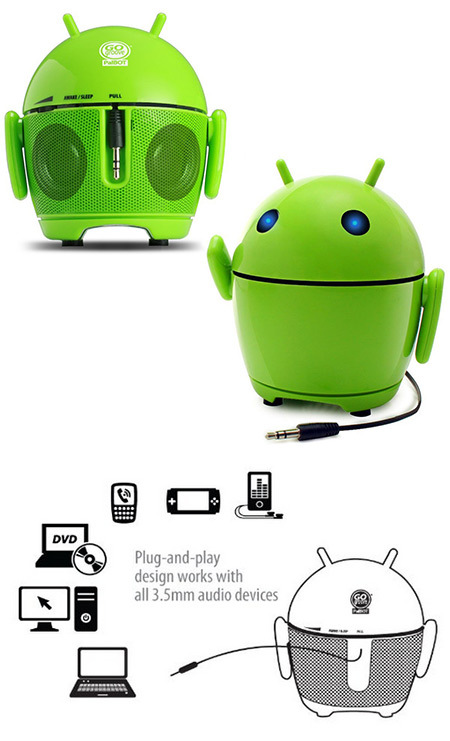 Based off Google’s Android character, aka the Bugdroid, the GOgroove Pal Bot Sound System features a universal design that is compatible with ANY & ALL devices equipped with a 3.5mm audio port. Android is a trademark of Google, Inc. The Android robot is reproduced or modified from work created and shared by Google and used according to terms described in the Commons 3.0 Attribution License. Boasting an impressive range of sound, the Pal Bot has two Dual Drive stereo speakers that are paired with a Passive Subwoofer on the bottom of the speaker for an extra powerful audio experience. Equipped with a long-lasting, rechargeable Lithium polymer battery, the speaker can handle up to 6 hours of use per charge with continuous audio playback at maximum output. At lower volumes, the speaker can last as long as 24 hours or more.